YMCA Victoria has served the community since 1853. A familiar not for profit affectionately known as ‘the Y’, they offer sport and recreation activities to local communities. With the YMCA’s great scale comes equally great diversity. To embrace and support the observation of diverse cultural and religious days of significance, the Y have a brilliant practical policy solution – offering religious and cultural leave. In Australia, we are accustomed to observing Christian holidays such as Easter or Christmas. For those who don’t identify with these holidays, they are able to work through these periods, and instead take leave for their own cultural holidays. This provides equal opportunity and flexibility for all members of the team to spend time with their family and loved ones. There are many proven benefits to providing religious and cultural leave, including higher productivity of staff, improved job satisfaction and higher staff retention. “The YMCA values and respects the cultural diversity of our people. We are aware of the varying needs of staff members with their religious, cultural and ceremonial beliefs and obligations.” YMCA Deputy CEO Michelle Bruggeman said. As the Australian community becomes increasingly diverse, this is just one of many initiatives the Y undertakes to ensure our newest Australians feel engaged and valued. A recent partnership between YMCA and Life Saving Victoria is training and employing people of Culturally and Linguistically Diverse (CALD) backgrounds to work as lifeguards at aquatic centres around Melbourne. Participants in the program said they felt proud to be working in places where they felt and were treated equally by everyone around them. This is consistent with the commitment of the Y to ensure that no matter their age, race, sexual orientation, gender, ability or socioeconomic circumstance, all employees, volunteers and members of the community are valued and supported. “The YMCA is excited to celebrate A Taste of Harmony and hold events across the organisation, from the Board and Corporate Office to our local Branches, to celebrate the diversity of our people. Our cultural heritage is a special part of who we all are today,” Bruggeman said. How many cultural and religious groups are represented in your workplace? 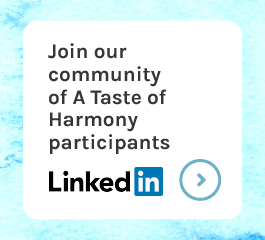 Holding A Taste of Harmony could provide a friendly and open opportunity to discuss varied holidays, beliefs and the foods we share to observe them. It can even help start a conversation about how HR policies can be reviewed to become more inclusive.